Don't purchase prescription pads that will not offer the security you want and the security that the government demands! These secure pads meet the requirements for Medicaid patients, and can also be used for all other patients. Your information is printed using penetrating magnetic ink to prevent chemical lifting of information during forgery. 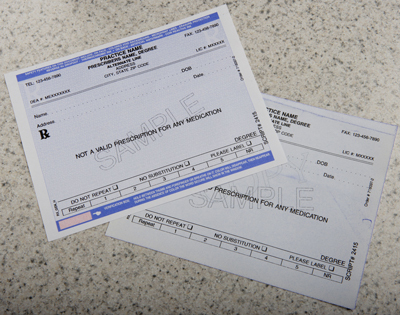 When rubbed or heated thermochromatic ink shows "SECURE"
If you want to print your own prescriptions using software in your office, our secure paper also meets the requirements for use with Medicaid patients, as well as all other patients. Tamper resistant background ink that shows attempts to alter script by patient. 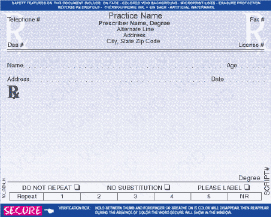 *Other than New York and New Jersey, Tamper Proof Prescription Pads/Paper are approved for all states, including CA, TX, and WA. Prices may vary by state.